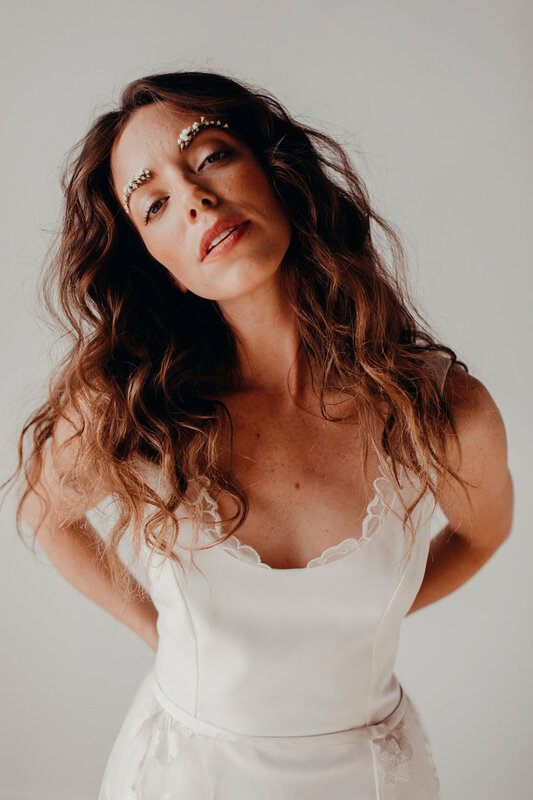 A quick note- Wedding makeup and hair trends are going more and more “model-off-duty” and less “Instagram airbrushed” which I obviously love, and stayed true to with this shoot. 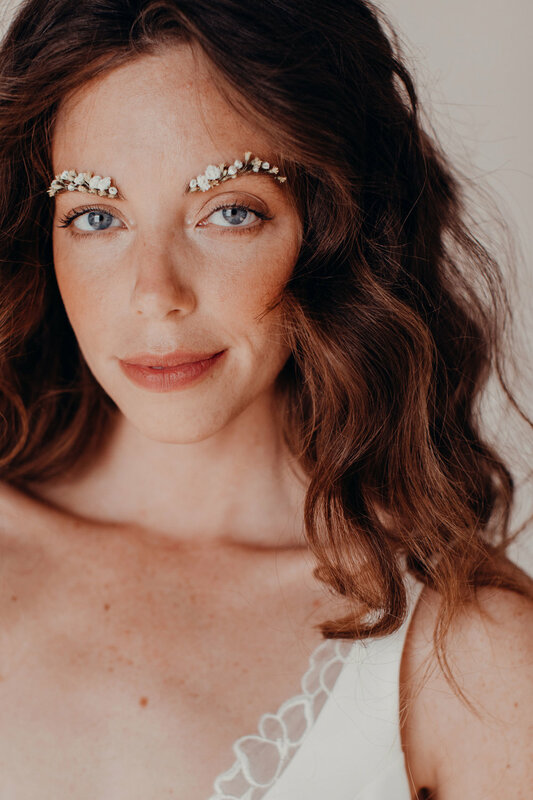 The flowers in her brows were a fun extra touch, and while most brides might not be quite ready to rock them, I’ll be happy to add them to my service list for any brides who might want to try them out. (And yes! They are real flowers!) How do you feel about them? 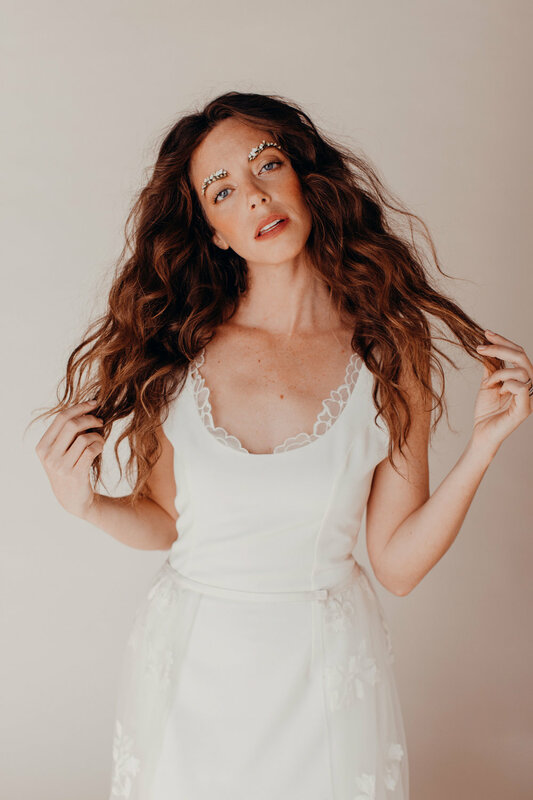 For the “natural” bride who wants to look a little more like an Anniston or a Saldana rather than a Kardashian: You prefer to keep things simple, so is it really worth hiring a makeup artist? YES. You don’t have to wear every item at Sephora just because it’s your wedding day, but you should pamper yourself and leave the stress of getting the makeup just right to a professional. 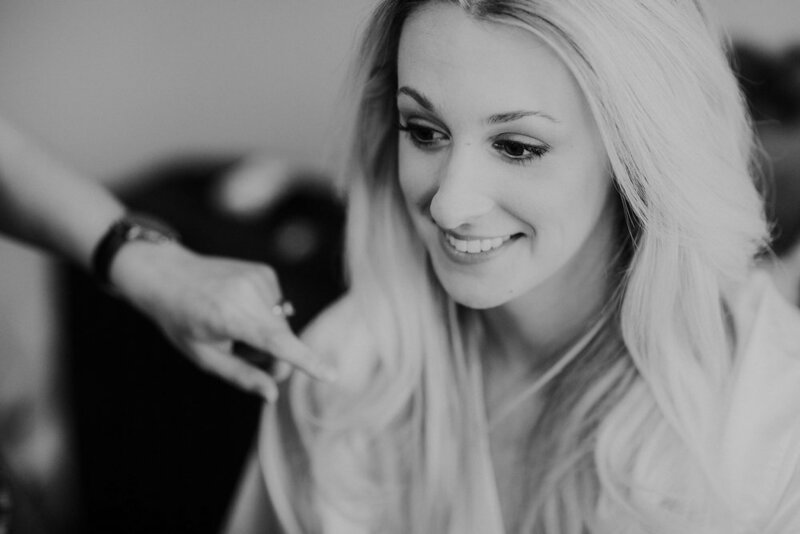 A great hair and makeup artist will know how to transform your everyday look into the perfect bridal look. He or she will create a glowing, camera-ready face that lasts all day, and highlights your best features. Not to mention, your fiancé and loved-ones will still recognize you when you walk down the aisle. To my brides who are completely inspired by the Kardashian family. Love glam hair and makeup every day, but not sure that youtube tutorials are going to cut it on one of the most photographed days of your life? The right artist will work with you to create the perfect glam look, making sure that the bold contour you love is so blended that your closest friends will think your cheekbones naturally look that sculpted, even in natural light. Plus, if you are going to look like a Kardashian, you should probably feel like one too. Pamper yourself. Now that you know why you need a glam squad, you need to choose the right one. When I said earlier that we aren’t all the same, I truly meant it. 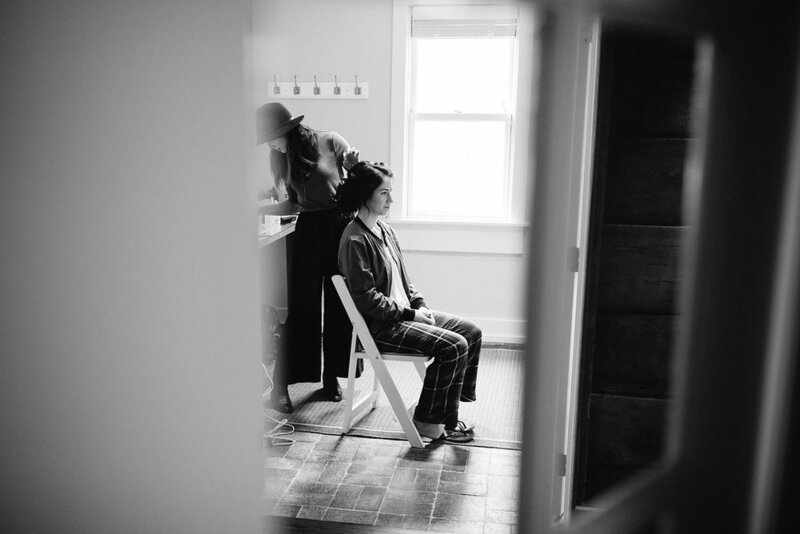 We each have our own styles of hair and makeup, as well as personalities. 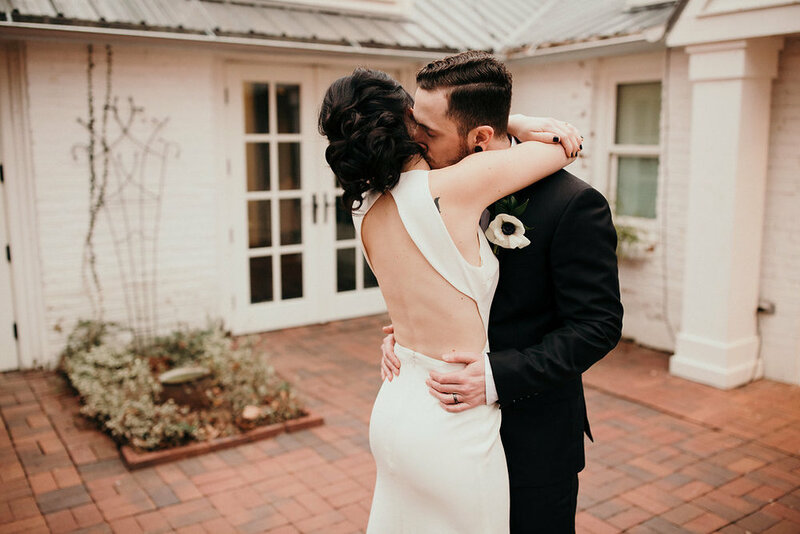 My first advice for you when choosing hair and makeup for your big day is to get a list of recommendations from other people whose style you like, then go through that carefully curated list, and look each person up. (Instagram and Facebook are okay, but try their professional website as well.) Does the website actually look professional? Do you like their work? Most importantly: DOES THEIR WORK LOOK LIKE THE MAKEUP OR HAIR YOU WOULD LIKE TO WEAR? An artist may have a beautiful hair and makeup portfolio, but if it isn’t your style, why would you hire them? I’ve definitely had people come to me looking for a style of hair and makeup that I don’t gravitate towards myself… and you know what? I’ll be the first person to tell them that I’m not the person they are looking for. 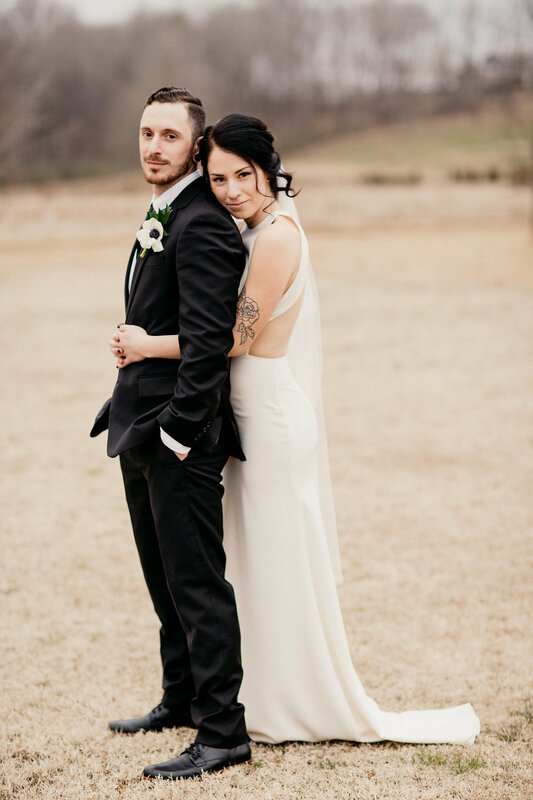 My favorite brides are the ones who send inspiration photos that I’ve actually pinned myself, or even photos of my own work, because I know we are on the same page, and I know that they want to hire me for my particular style of work. After you find an artist whose work you want to wear every day, now you need to make sure that they are available and in your budget. When inquiring for prices, be yourself. Tell them a little about your wedding, including where it will be, and give them an idea of how many services you may need. Also, it should go without saying, but please remember that “you get what you pay for”. If they are available and in your budget, the next step would be to meet them. Whether it's a bridal preview, a phone call, or just a meeting over coffee, try to get to know them. Ask questions so that you understand how their business operates. Ask how they schedule a day, and how many people they will need to bring along to complete your services. 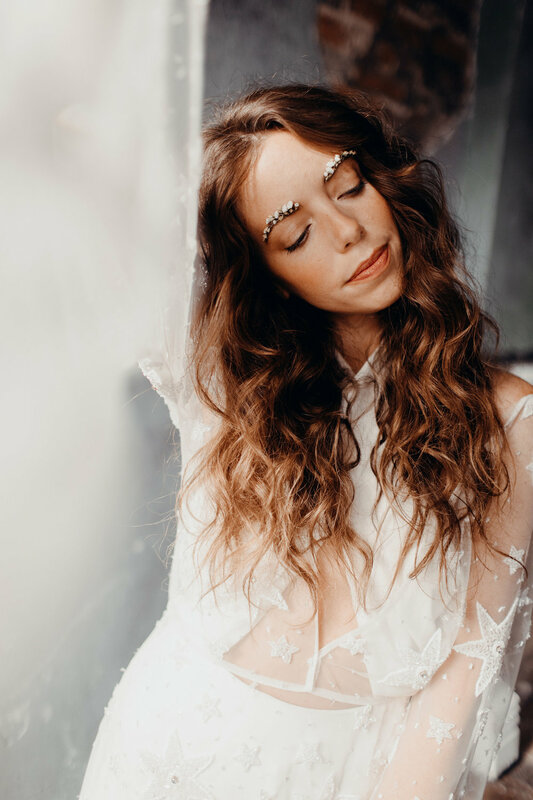 Do you feel confident in their ability to create hair and makeup that matches the entire wedding style and esthetic not just for you, but also for your bridesmaids? Do you feel confident in their ability to manage situations under pressure? 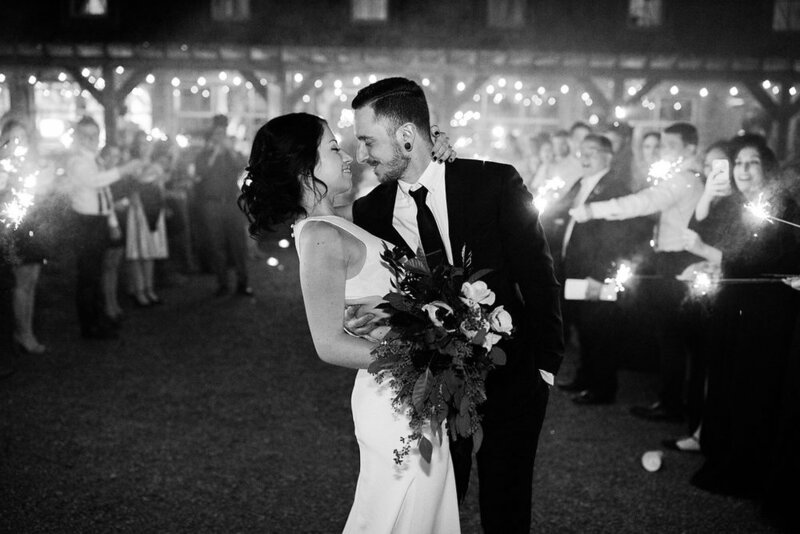 Do you like their personality and want to be around them on your wedding day? I personally tend to be really calm and focused. I love to be there for brides and just help them feel relaxed. I try to act as a buffer if there are any high-maintenance bridesmaids, mothers, or even wedding planners around. Some artists are more energetic. They make the day into a high-energy, fun sort of party. Some artists are literally there to do your hair or makeup and then be done, while others are willing to help you create an entire look and guide you on anything from hair pieces and skin care to spray tans and brow shaping. Think about what you truly want, then when you decide that you’ve found the right person, be ready to book right away. Let your bridesmaids know who you’ve chosen, how much they cost, and most importantly, let them know why you’ve chosen them. Encourage them to look up the artist’s work before-hand, and let them know that you’ve chosen that artist because of his or her individual aesthetic. Not just the title of “hair and/or makeup” they hold. 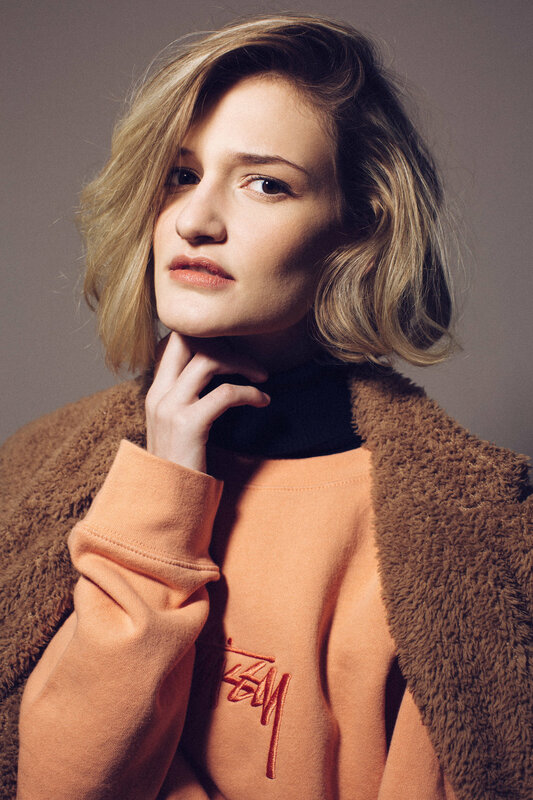 Hair and Makeup: Hannah Farmer. Model: Aliene Brooks for Eye Management. 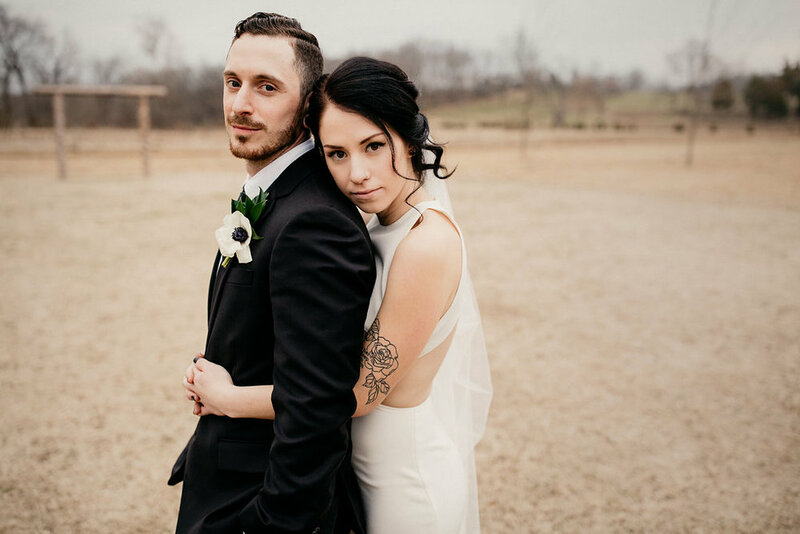 My first wedding of 2017 took place on a beautiful but dreary day back in February. 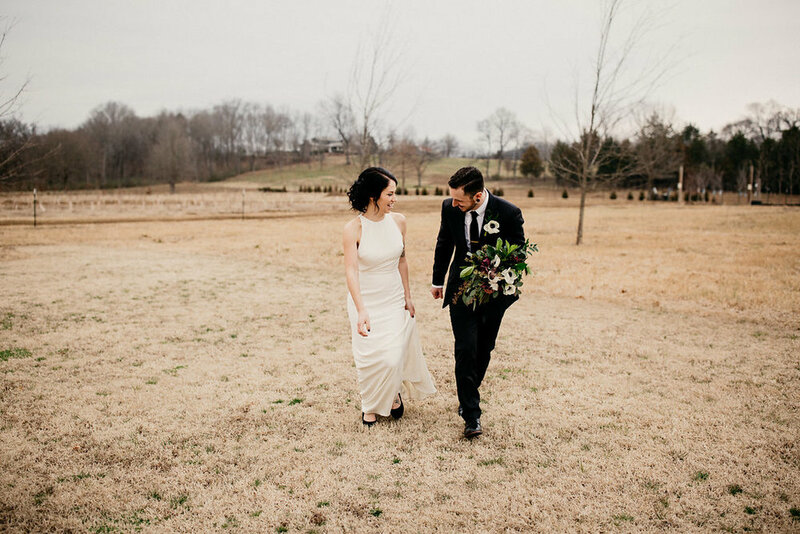 Long Hollow Gardens in Gallatin, TN makes such a warm, inviting venue and their farmhouse was the perfect place for the bridal party to relax and get ready for the day. 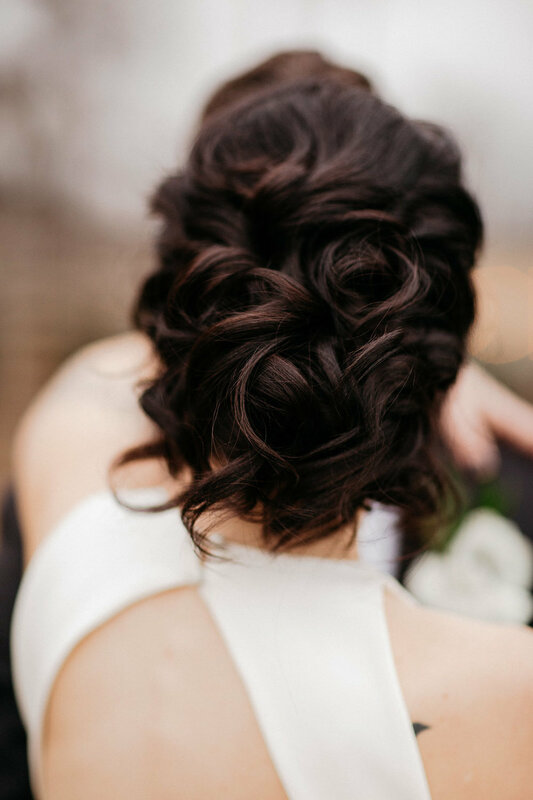 The bride, Reina's exquisite, classic taste was apparent in every decision she made, from her sleek dress to her textured hair. Her color palette was classic black and white, perfectly warmed up with greens and plums. 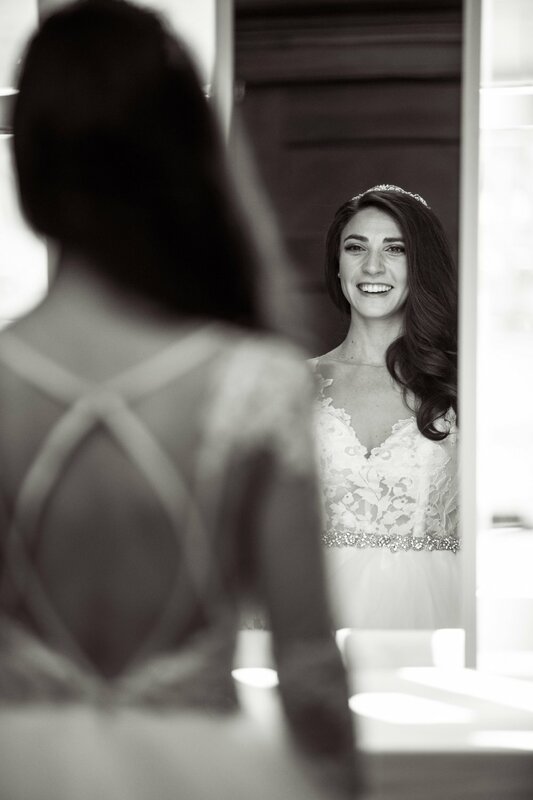 I was honored to do her hair and makeup, and I especially loved the chance to work on a wedding with my husband, Seth, who was her photographer. Every now and then I have the honor of doing hair and makeup for an up and coming model. These test shoots are usually low-stress opportunities to pull from inspiration or ideas that I wouldn't normally get the chance to try. This particular shoot, with Laci from Eye Management, was one of those shoots. My husband, Seth Farmer, was the photographer and our friend, Teddy Boldt, styled and gave a little creative direction. When I saw Teddy and Seth's inspiration, I knew that I wanted to keep things somewhat muted on my end. (Palm trees and colored lights didn't seem to need very much back-up in the makeup department.) I wanted Laci's hair to be more polished than her natural texture, and her makeup to be naturally "there". I basically water-colored her eyes and lips, staining them ever so slightly. For her second hair look, created a loose, tucked bun. A "sophisticated gym do" if you will. We had a lot of fun playing around with this shoot, so I decided to share it with you. Let me know what you think! 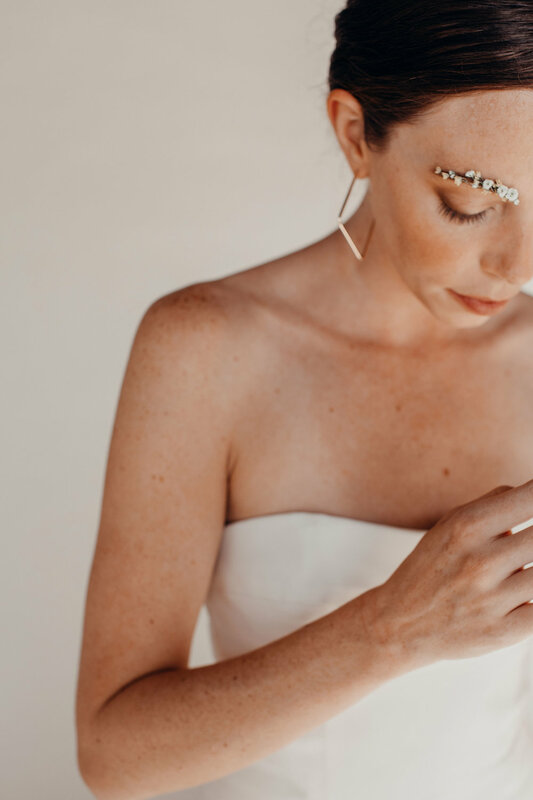 Simplicity speaks to my minimalist heart, so no wonder this bridal look is one of my favorites. When I look at this bride, I can picture the wedding. It’s in a garden. No, a small white church in the middle of a field of yellow flowers. She’s madly in love and her focus is on the one she loves rather than the party. The reception is a brunch with the couple’s closest friends. A French brunch, to be exact. There is no shortage of cheese and champagne and croissants. When they arrive home, she hangs the flowers to dry, then they are out the door for eight days in the South of France. My skin with only under-eye concealer, mascara, and blush. If skin is taken care of, then less makeup is needed. When less makeup is needed, the individual becomes the star, with skin care and makeup working together in supporting roles. Since skin care is so important to me as an artist, I thought I would take the opportunity to share some tips, as well as my own personal routine. This routine would be great for most people with oily or combination skin, sensitive or not. First things first, the key to any skincare routine is consistency. So many people try a product for a few days, or go through their full routine every other day or once a day. I have never met anyone who ended up with great results from that process. Skin care routines should be followed through every day, morning and night. Once you start a routine, you should start seeing full results in 30 days. So my routine: I started using a brand called Beautycounter about 3 months ago. I love the products and the ingredients so much that I even became a consultant, mostly because I wanted to be able to recommend a great line of products to my clients. In my opinion, these are the best performing and also the safest products I’ve tried. I bought the nourishing line first which is just that; all my sensitivities seemed to disappear pretty quickly. After using the products for a month, I was happy, but not amazed like I had been when I first tried them late last year. I decided that I needed a slightly more cleansing face wash, so I added the charcoal face bar to my routine. I also started adding a couple drops of the balancing oil to both my day cream and my night cream. With these additions, my skin began to brighten and look healthy. I don’t feel like I’m playing the balancing game anymore because the products I’m using are perfectly balancing! After another month Beautycounter rolled out the charcoal mask, so I do that a couple times a week, also using it as a spot treatment when needed. I am beyond thrilled with how soft my skin feels, and how balanced my complexion looks. (WITHOUT HARMFUL CHEMICALS!) I love skin care, and what I love about Beautycounter’s skincare is that is safe, customizable, and that from my experience, it works. – Clean your phone screen. – Don’t touch your face. – Don’t pick at your face. I know the struggle is real but this really makes a breakout worse, and it can cause other blemishes to appear. – Pay attention to what you eat. Diet makes a huge difference. – Don’t over dry. Turning your skin into the Sahara Desert damages your skin, and can even make it more oily and clogged in the long run. Not to mention that makeup never looks good on dry skin. Cleanse with the Charcoal Bar. Tone with a combination of Apple Cider Vinegar and Water. Apply Beautycounter’s Rejuvenating Eye Cream. Apply one pump of Beautycounter’s Nourishing Day cream and two drops of the Balancing Face Oil. Apply Beautycounter’s Protect Stick Sunscreen. Remove makeup with the Nourishing Cream Cleanser. Apply one pump of Beautycounter’s Nourishing Night Cream and two drops of the Balancing Face Oil. Raw, Organic Honey Mask 20 minutes, then use to exfoliate. Minnie is a Photographer, but honestly she is just as superb in front of the camera as she is behind it. She even has the skin that makeup artists dream of (ZERO VISIBLE PORES), which is exactly why I couldn't bare to cover it up. I started out with the bare minimum: light coverage, peachy cheeks, and just the slightest amount of tight-lining on the top lash line. Eventually I played up Minnie's eyes to the slightest degree; tight lining the bottom and filling in her brows. Those gorgeous lashes are real, and the peachy lips? I just enhanced her natural hew. 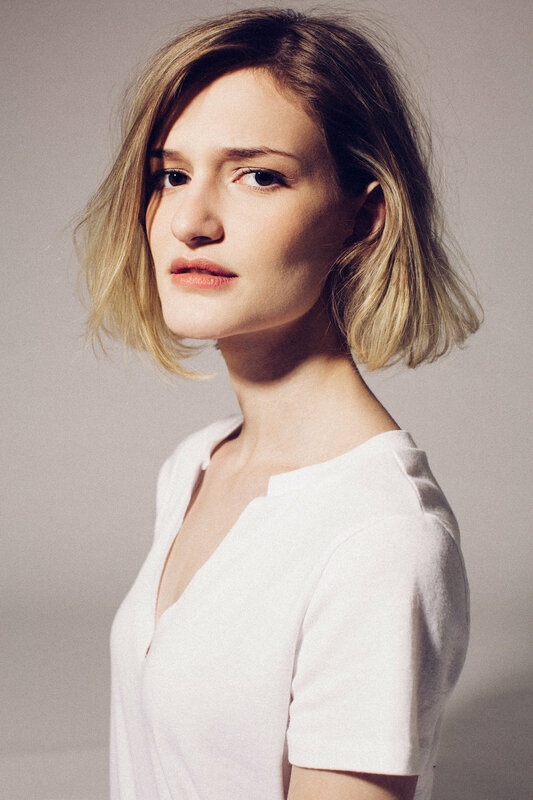 All this simplicity is accompanied by Seth’s use of natural light, the effortless waves I added to her hair, and the clean wardrobe we chose. Needless to say, I’m quite happy with the results. Oh and Minnie? She's just a beautiful person all-around. Inside and out.